Major League Baseball has drastically changed while under new Commissioner Rob Manfred but as redundant and contradictory as this sounds you probably can’t notice it too much unless you’re really looking for the change. Instant replay has been expanded, nets have been put down the first and third base lines, pace of play has been implemented, you can’t mow down the catcher at home plate as a runner anymore, spending restrictions have been implemented on teams who exceed the new international spending cap on free agents, draft pick compensation is now being bounced around for spending too much on your overall team payroll and a plethora of other changes we could talk about. Not all have been impeding though, some have been fun. Youth has been put back into the game and the game seems fun again and that will only continue later on this month when Major League Baseball has “MLB Players Weekend.” Here are my thoughts on the weekend. From Friday, August 25 to Sunday, August 27 MLB will let the player’s personalities and passions shine like never before during MLB Players Weekend. We have already seen the new jerseys and hats being released this week as well as jerseys that will have nicknames on the back. Sonny Gray will sport the name “pickles” on his back during that weekend while Aaron Judge will be “All Rise” above his number 99 jersey number. 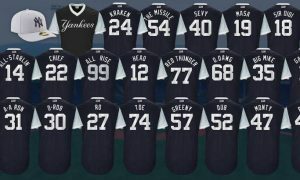 All clubs will wear nicknames across their backs including the Yankees who haven’t had names on the backs of their jerseys in over 100 years which should be an odd change of pace, but a fun one nonetheless. Also throughout the weekend players will be allowed to wear uniquely colored and designed shoes (which would normally violate some teams rules like the New York Yankees who only allow black spikes to match their uniforms), batting gloves, wristbands, compression sleeves, catcher’s masks and of course baseball bats. Players can also wear t-shirts and clothing to support their charities of choice during pregame workouts and postgame interviews, something else that is general frowned upon by the league any other time throughout the season. The best part about the weekend for me, well besides bringing in new and younger fans to the game, is the patch on the right sleeve that all player’s jerseys will have on it giving the players the opportunity to write the name of a person or organization that helped in their development as a person and towards the game. I absolutely love everything about this idea and everything about this event and I truly think you should too. It gives back to the game, to the fans and to the communities in such a way that no other sport is doing right now which makes me extremely excited and proud to be a fan of not only the New York Yankees but of Major League Baseball as well. Check out MLB Players Weekend here in two weeks!